You might think of New Orleans as the place to be during Mardi Gras or a Super Bowl game, but it's plenty of fun over the winter holidays, too. 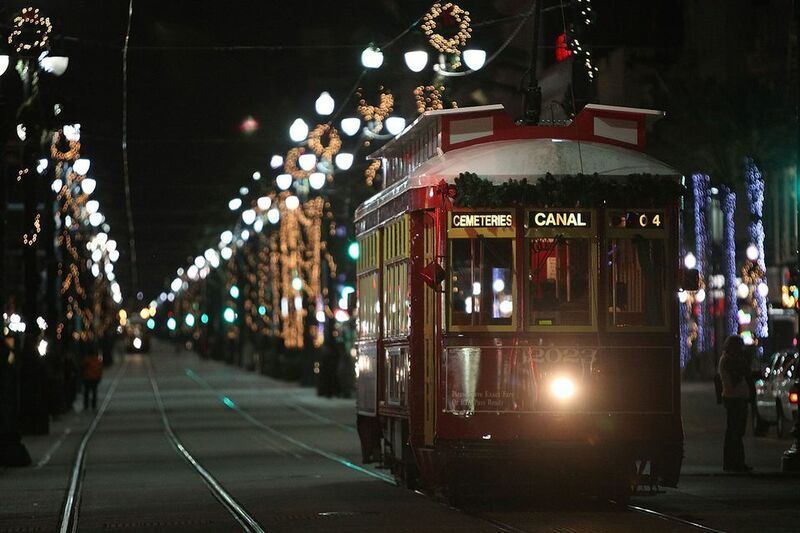 Featuring great shopping in the French Quarter and on Magazine Street, holiday home and garden tours, and thrilling college football games during the winter season, NOLA is filled with festivals, tree lightings, caroling, concerts, and, ultimately, the Christmas spirit during the holidays each year. Even if you're not in the holiday mood during your trip to New Orleans, there's plenty to keep you entertained during the Christmas season—be sure to get yourself to Frenchman Street in Faubourg Marigny if you need a break from all this Christmas stuff and want to listen to some great music acts. However, if you are looking for a great Christmas experience while visiting the Big Easy, explore the following list and plan your itinerary around these great holiday traditions of New Orleans. Celebration in the Oaks is New Orleans' most beloved holiday event. From the day after Thanksgiving until early January, City Park is turned into a most beautiful wonderland that's become a must-see for locals and visitors of all ages. A tradition since 1986, Celebration in the Oaks is one of the Parks Department's biggest annual fundraisers and accounts for 13 percent of the total annual budget for the department, so your trip to see the lights, sounds, and magic of Celebration in the Oaks could help keep it a tradition for years to come. The 32nd Annual Celebration in the Oaks will start on November 16, 2018, with a preview party, followed by "Jingle Bells & Beer" on November 17, and a family party on November 18. Then, the festive attraction will be open November 23 to 25 then again November 30 through January 1, 2019. The St. Augustine Church hosts a variety of Christmas concerts that are scheduled in the early evenings on many days in December. Produced by the French Quarter Festivals, Inc., these concerts are free and open to the public, but donations go a long way to helping maintain this tradition from year to year. If you're staying in the Treme neighborhood, stop in for some holiday inspiration with performances of jazz, gospel, and funky soul. Check the official website for more information on performance schedule, music acts, and location. A wonderful 19th-century Creole tradition, Reveillon Dinners are still celebrated in restaurants all over New Orleans, but these events, which trace their roots to Creole French families, only happen over the holidays. Top-line restaurants offer these dinners, which offer special menus for dinner, during which large families are often seated around equally large tables. Check out the official website to see all the participating restaurants and book a reservation today! Whether it's the Beauregard-Keyes House, Gallier House, the Lousiana Museum's 1850s house, the Old Ursuline Convent, or the New Orleans Pharmacy Museum, New Orleans residences are beautifully decorated for the holidays, and many are open to the public for tours. Local organizations Patio Planters and Preservation Resource Center conduct these guided tours, which walk visitors through some of the most beautiful classic homes NOLA has to offer. Check out the official website, select whether you want to take the "Homes of the Garden District" or "Homes of the French Quarter" tours, and get excited to see some of the finest decorations in the city. Many teas around the city are Teddy Bear Teas, specially designed for moms and grandmothers to enjoy with the kids, and there are even a few specialty Christmas teas with Santa and Mrs. Claus. Skip the malls and shop New Orleans style on Magazine Street and the French Quarter for antiques, decor, accessories and only-in-New Orleans stocking stuffers. The French Quarter also features the annual French (Christmas) Market, a tradition in the city since 1791, and the Outlet Collection at Riverwalk and the Shops at Canal Place, which both are within walking distance of one another, are great places to buy those last-minute holiday gifts. Another Creole tradition that's stuck around through the years is the annual Levee Bonfires that take place multiple times over the Christmas holiday season. You can book an narrated tour on the Grey Lines Tours' motor coach excursion for a better seat, and one of the options, the Christmas Eve Bonfire Adventure Tour, even offers a tour of the San Francisco Plantation complete with a farm-to-table meal. Canal Street, the great divide between the old Creole section of the city and the so-called American sector, is one of the widest main streets in America and the center of New Orleans' holiday lights and celebrations. The lighting of Canal Street usually takes place right before Thanksgiving and includes a parade and street parties. The Sugar Bowl is a great time for college football fans, and it's played every year in the Mercedes-Benz Superdome in New Orleans. If football's your game, New Orleans is the place to be around New Years because sports bars and venues across the city will be tuning into the big game all day long. Then, you can party afterward on Bourbon Street (win or lose) for a total NOLA experience.